Intellivision Entertainment has issued a press release announcing that a new video game console is under development. The planned device is being designed and created by a team that has members who worked on the original console that bore the renowned Intellivision brand name. Details of the new platform are expected to be made available on October 1. It was always my favorite system because the games were cutting edge, yet fun and simple to play so our entire family could enjoy them together. I find those important elements to generally be lacking from our industry with the current modern gaming consoles. Our goal is to change that by focusing on bringing all age groups and levels of gamers and non-gamers together while introducing new generations of people to the legacy success of the Intellivision brand. Nostalgia is rife in the game industry at present, with Nintendo enjoying great success with the NES Classic Edition and Super NES Classic Edition devices and Atari working on the VCS console. The original Intellivision console was released in 1979, and it went on to become a best-seller with over three million devices sold. According to a report, the 21st century version of the console will also work as an emulator, allowing gamers to play classics from the 1980s like Major League Baseball and Advanced Dungeons & Dragons. The press release mentions details about the new platform will be given on October 1, and it is currently possible to sign up for the opportunity to purchase a Limited Edition of the console (first 100,000 applicants only). A Facebook Live question and answer event is scheduled for May 31 at 12 p.m. PST. IRVINE, Calif., May 29, 2018 /PRNewswire/ -- Intellivision® Entertainment is proud to announce that it will bring the concept of SIMPLE, AFFORDABLE, FAMILY & FUN back into homes across the world with the introduction of a brand new home video game console. The original Intellivision system generated many "firsts" in the video game industry including the first 16-bit gaming machine, the first gaming console to offer digital distribution, the first to bring speech/voice to games, the first to license professional sports leagues and organizations and the first to be a dedicated game console and home computer. Originally released in 1979, due to its popularity it was remarkably retailed across 3 decades and quickly sold millions of units. The new Intellivision system (name TBA) will carry on the company tradition of "firsts" with its new concept, design and approach to gaming. Video Games Live™ creator and 30 year video game industry veteran Tommy Tallarico has been named President of Intellivision Entertainment as the company turns its focus on a rebranding and reimagining for the 21st century while still paying homage to its legacy roots. "I grew up playing Intellivision with my parents and younger brother," says Tallarico. "It was always my favorite system because the games were cutting edge, yet fun and simple to play so our entire family could enjoy them together. I find those important elements to generally be lacking from our industry with the current modern gaming consoles. Our goal is to change that by focusing on bringing all age groups and levels of gamers and non-gamers together while introducing new generations of people to the legacy success of the Intellivision brand." Details of the new console will be released on October 1, 2018 and followers can subscribe to updates at www.IntellivisionEntertainment.com. The first 100,000 people to sign up on the website will get the exclusive opportunity to purchase a special and unique Limited Edition version of the console which will not be made available in stores. An interactive Facebook Live event to answer questions from fans is scheduled for Thursday, May 31st at 12:00pm PST at: www.facebook.com/IntellivisionEntertainment. Interviews about the new console can be scheduled by contacting [email protected]. In-person interviews will take place in the National Videogame Museum – South Hall Booth #701 during the 2018 Electronic Entertainment Expo (E3) in Los Angeles. Intellivision was the first 16-bit game console, a full 2 generations before it became the industry standard. The original Intellivision system was so popular that it sold across 3 decades (1979 – 1990). The Intellivision control disc was the predecessor to what later became the industry standard directional pad (D-Pad). It was also the first game console to allow for 16 directions while offering 4 action buttons and a 12-button keypad, which opened up greater game play options and control. The Intellivision was the first video game console that had a built in PAUSE feature. The very first video game to have speech/voice was the 1979 Intellivision release of Major League Baseball. Intellivision was the first console which incorporated professional sports licensing for its sports games, the boxes were emblazoned with official logos from Major League Baseball (MLB), National Football League (NFL), National Hockey League (NHL), National Basketball Association (NBA), Professional Golfers' Association (PGA), North American Soccer League (NASL), Professional Bowlers Association (PBA), American Backgammon Players Association (ABPA), the United States Chess Federation (USCF) and the U.S. Ski Team. Intellivision had the largest home console software library in the world with the release of their cross-platform "System Changer" device that allowed Atari® 2600 games to be played on the Intellivision system. 30 years ahead of its time, the Intellivision was the very first game console to offer digital distribution of video games through the PlayCable service. The PlayCable adapter connected to the Intellivision cartridge port and allowed the downloading of games through a cable TV subscription. New York Yankee legend and Hall of Famer Mickey Mantle was the TV and print ad spokesmen for the product which was released in 1981. 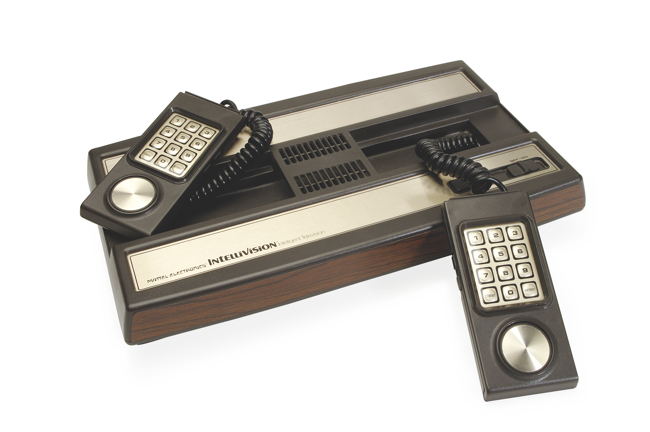 With the release of the Keyboard Component, Intellivision became the first video game system that was able to be used and turned into a home computer. The Intellivision game Utopia© was the very first "real time strategy" and city building/god game. Intellivision was responsible for the first "Console War" when it launched a national ad campaign against then rival Atari®, by using side-by-side comparisons with journalist George Plimpton as its spokesman.